After stumbling upon the Music Video preview for MACO's physical single debut, LOVE, I was hooked on the sound of her voice and the beauty of the song that I had heard from the second that it had started. Sadly, it wouldn't be until a Month later that I was able to listen to the full track list for this lovely single - but, upon hearing each song, I knew that MACO was someone I would want to keep an eye on in the near future. Simply put, she is incredible, and she is music to my ears. Literally. Debuting back in 2014, singer-song writer MACO became known for her cover songs from popular artists such as Taylor Swift. 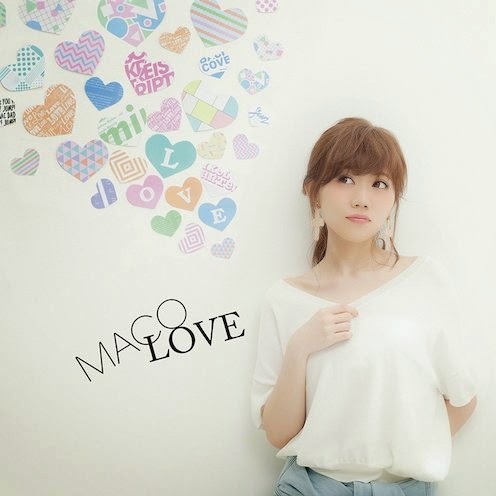 Now, after releasing digital mini-albums, a full length album and three digital singles, MACO has finally released her first long-awaited physical single, LOVE. The single contains four songs, three of which are original tracks, and the fourth which is a cover of m-flo's ONE DAY. All four songs lend to MACO's vocals beautifully, showing off the clear talent that she has and creating a beautifully crafted single for many to enjoy. The titular track LOVE is upbeat and lively in its composition, delivering a hopeful and romantic sound to its listeners. The video is as sweet and uplifting as the song is, showing off various relationships and enhancing the joys of love. It's a beautiful song that is fun, but still lends to the mature sound of MACO's wonderful vocals. The other tracks included in the single are just as wonderful as LOVE is, with each leaving a different impression to the title track for the listeners. Haru no Kaze is a gentle yet upbeat song that feels effortless and easy to listen to, whilst a track like Shiawase no Hajimari, which was previously released as a digital single, is a beautifully composed piece about happiness and gratitude, however may leave the listener with the idea of loneliness thanks to the emotional tone of both the composition and MACO's heavenly voice. The final track, ONE DAY, is a ballad cover of m-flo's original song, and done so beautifully. MACO delivers a passionate performance that sounds heartfelt and romantic with each note, and concluding her debut physical single with as much passion as she had in the title song. MACO is a wonderful singer-song writer who deserves more credit than what one person can give her, and hopefully after this she will be deserving of your attention. A great artist who seems enthusiastic and passionate, MACO is someone that you should keep an eye on for the rest of this year, and the next. Until my next post, please take care, and love Idols and Music with all your heart! You can buy MACO's LOVE at CDJapan.